U.S. 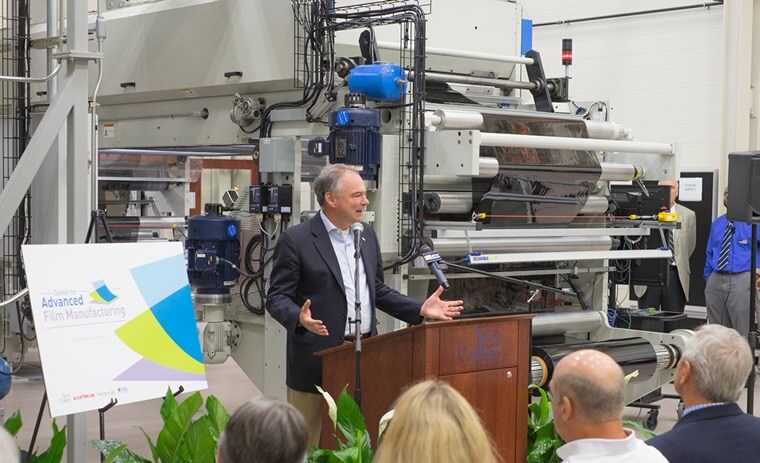 Senator Tim Kaine was on hand to help unveil the new training equipment at the Center for Advanced Film Manufacturing. Photo courtesy of CAFM. A new machine installed at the New College Institute (NCI) should help Martinsville-Henry County keep high-tech companies and attract new ones by ensuring that people can learn advanced skills they will need to work for the firms, local industry representatives, educators and others said Thursday when the device was unveiled. The academic coater is a one-of-a-kind, roughly $1 million machine to be used by the Center for Advanced Film Manufacturing – a partnership of NCI, Patrick Henry Community College (PHCC), the Martinsville-Henry County Economic Development Corp. (EDC) and Eastman – mainly to train people for jobs with Eastman and other performance film manufacturers. The Center for Advanced Film Manufacturing is a 28-credit program intended to teach people the skills they need to make performance films, such as ones installed on windows to block solar radiation, with computer-run equipment. But the coater could be used by other companies to teach skills common to all advanced manufacturers, NCI officials said. Although it was designed to be a teaching machine, the coater is very similar to technology used by Eastman, said Ralph Schultz, a company employee who helped to develop the device. And, "this combination of both (a teaching and manufacturing device) does not exist" anywhere else within the realm of academia, Schultz said to his knowledge. When teaching, instructors will be able to manipulate the machine so that students can make mistakes when using it and learn how to overcome those mistakes before they get jobs, helping them avoid making those mistakes on the factory floor, said NCI Acting Executive Director Leanna Blevins. "That will give them an advantage (in getting jobs) that we didn't have," said Robin Crowder, one of the first graduates of the film manufacturing program, referring to herself and her peers. "This (piece of equipment) is once in our lifetime," said PHCC President Angeline Godwin. "We had the opportunity to create something that's never been created before." The fact that NCI has the coater now should "speak volumes" to companies interested in moving to the area, EDC President and Chief Executive Officer Mark Heath said, by basically saying to them that if the community was willing to do something special to meet the needs of one industry, "we can and will do this for you," too. The challenge for any company involved in advanced manufacturing is finding people who are well-qualified to do jobs they offer, said Brian Miller, superintendent of Eastman's utilities division. State Sen. Tim Kaine was the keynote speaker for the unveiling. He said the presence of the coater at NCI "will cement this (performance film) industry here" in Martinsville-Henry County and should give the community an advantage at attracting performance film manufacturers and other high-tech companies. The coater is part of "a renaissance ... a new way of thinking about education" that involves innovation, Kaine said. It is "a great example of 21st century educational thinking." Kaine mentioned that Southern Virginia is attracting more and more high-tech companies. It shows that "innovation is not just about Northern Virginia, Silicon Valley or Boston" anymore, he said, referencing three areas of the nation with heavy concentrations of high-tech firms. The coater was paid for with funds from the state, the U.S. Economic Development Administration and The Harvest Foundation, Blevins said.